Spoilers: We’ve Got A Fan Theory About M. Night Shyamalan’s SPLIT | Birth.Movies.Death. Don't read this until you've seen SPLIT. Final Warning: This post contains spoilers for M. Night Shyamalan's Split. As many of you know by now (hopefully because you went and saw the film for yourselves, rather than having some dipshit spoil it for you on social media), M. Night Shyamalan's Split is actually something of a stealth sequel to Shyamalan's Unbreakable: in the film's final moments, we learn that everything we've just seen takes place within that 2000 film's reality, a final revelation delivered via a mindblowing little cameo by none other than Bruce Willis. There's no doubt, in other words, that these two films are connected. But what if they're more connected than we originally thought? I first caught Split all the way back in September, at Fantastic Fest, and have been looking forward to giving it another whirl ever since. 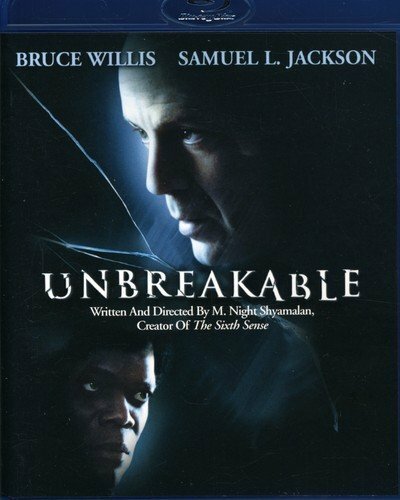 As an Unbreakable mega-fan, I was eager to see if there wasn't another other connective tissue to discover. And y'know what? I think I might've found some. About an hour into Split, there's a scene where Kevin Crumb (James McAvoy) takes a meeting with his therapist, Dr. Fletcher (Betty Buckley). Dr. Fletcher wants to know more about The Beast, the superpowered conglomeration of personalities threatening to break out of Kevin, and lays out some backstory: Kevin claims to have never met the The Beast, but knows he lives in a trainyard. Dr. Fletcher theorizes that this is because Kevin's father got on a train some years prior and never came home. With Kevin's father out of the picture, Kevin's mother subjected him to some truly horrific abuse, and in the process helped birth the "Dennis" persona who would eventually lead the charge towards Kevin becoming The Beast. Later in the film, we see Kevin visit a train platform and lay out a bundle of flowers just before entering a train and letting The Beast take over once and for all. The implication, of course, is that he's mourning his dead father. So, what does all this add up to? I think the train Mr. Glass derails in Unbreakable - the same crash that leads him to Bruce Willis' superpowered David Dunn - is the very same train Kevin's dad was on. Kevin's dad dies in the crash, never comes home, and whoops: in the process, Mr. Glass has inadvertently created another supervillain. Making Mr. Glass responsible for both the creation of David Dunn (SuperDunn?) and The Beast would be a fitting little twist, but what might that mean for this story going forward? Well, we know David Dunn's aware of The Horde (as he's being referred to in the closing moments of Split), but is The Horde aware of Mr. Glass? More importantly, is The Horde aware of Mr. Glass' train-related hijinks? How would he react if he were to become aware? I have no idea, but there's a lot of conflict to be mined here. Admittedly, this theory isn't perfect. For one thing, it's unclear how old Kevin is supposed to be in Split, so I'm not totally convinced the timeline works out (Unbreakable was released about 17 years ago, though, so if Kevin's in his mid to late 20's in Split, I think it's possible). For another, it's never specifically stated that Kevin's father is dead (those flowers Kevin leaves on the platform are telling, but they're far from definitive). This is pure speculation ... but it feels right, doesn't it? Then again, maybe not! I'll let you guys hash it out in the comments below. Tell me: do you think I'm crazy, or am I onto something here?